Georg Jensen is the name of a famous Danish silversmith; of a world renown group of artists and craftsmen who created silverworks of their own design for the company begun by Georg Jensen; and of a style of silver products which represents a union of artistry and craftsmanship of the highest quality with many facets, since many artists contributed to it. During Georg Jensen's life, all of the artists and craftsmen working at the silversmithy he created, were influenced by his style. And sometimes, especially in the case of Johan Rohde, the influence went both ways. All of the design of the early years though coming from different artists, came within the framework of one recognizable style, identified as the "Georg Jensen style" This style underwent many modifications until Jensen's death and even more thereafter. But the basic characteristics of that early Georg Jensen style remain constant. Today many designs of Georg Jensen and his early associates are still produced, side by side with the work of younger more modern designers. The characteristics of Jensen's style underscore one of the most distinctive aspects of his workshop: designers in the workshop were not only encouraged to have free reign in their work, but were fully credited with their designs. In ninety-five years, the Georg Jensen company has employed over ninety designers. Some of the better-known Jensen designers included Gundolph Albertus, Johan Rohde, Harald Nielsen and Henning Koppel. 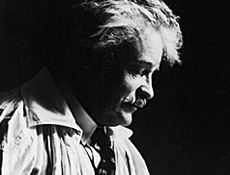 Georg Jensen was born on August 31, 1866 (the seventh of eight children) in Radvaad, Denmark, a cluster of homes around a factory north of Copenhagen in a lovely countryside. The location of Jensen's birth and early childhood was an important factor in his lifelong work which always reflected natural forms and themes from nature. Jensen came from humble beginnings. His father was a grinder who worked in the knife factory in Radvad, these days the deer park, Dyrehaven north of Copenhagen. His mother was a housemaid and the daughter of a travelling locksmith. Jensen worked with his father at the factory from an early age and had little schooling. He was always creating things as a child and his family recognized and tried to encourage his artistic instincts. When he was 14 the family moved to Copenhagen so he could be apprenticed to a goldsmith. Apprentices worked long hours in those days and on Sundays he attended a technical school for additional training. What little spare time he had he spent modelling clay. His desire seems to have always been to become a sculptor. © 2019 Grasilver.com. All rights reserved.